Traffic is everything in blogging, it is also true there are many ways to drive traffic to your blog, but broadly if we will classify this then, there are only two ways to drive traffic to blog, one of them is free like from search engines(Google, Yahoo, Bing, Ask), social medias(Facebook, Twitter, Google Plus, StumbleUpon), Email marketing(Feedburner, Aweber) and the another way is paid advertising. Well, if you are new to blogging world then I will suggest you don't spend money in paid advertising because in blogging you will share information for free like all bloggers do to create a great blog for readers, I think you should also do the same thing, otherwise you can create your own product then selling on Clickbank etc this is different, right and need experience to make money from it! But in this blog post I am going to share with you, my own methods, those methods I am using from last three years "to drive traffic to my blogs", my one blog which is a popular blog www.rehut.org but in the field of education in India, so whatever I shared in this blog(www.senomic.com) those are from my experienced. I think you should not go for paid advertising for promoting your blog but even then, if you want to do blogging only, I mean blogging is your only work then you may try Facebook for promoting your Facebook page, because if you will promote your Facebook page, it will create reputation of your blog as well as you will get those people for forever, but in pay per click advertising you will get visitors for one time only right! So, if you are crazy about blogging to increase your blog readers then go for Facebook. Now come to the best part of this blog post, that is how would you able to get ton of visitors, oh sorry targeted visitors to your blog, of course for free, actually I have break down those methods in 15 ways, that's why you can understand about those methods quiet easily. The biggest mistake many bloggers do(newbie even some experienced), i.e. 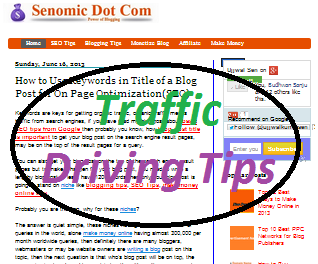 they do not write a lengthy articles because they do not have that much patience level to write an article of having about 2000 words, so I will suggest write a lengthy article, if you want your blog post will be top of the search engine result pages, because traffic from search engines are best ever traffic that's why those traffic are called organic traffic. So, I will first tell you read more and more articles of other blogs before going to write any article, oh you are thinking how would you find same articles on other blogs, dear search on Google, you will find tons of articles out there, read those articles and then note down on your note book, what they are providing and what they are not. Now it's time to do little experiment on those tips, what you got from those articles now apply those tips in your blog then see how many tips are working for your blog and how many tips are not working for your blog. Now share those tips only, those are working for your blog, see why I am telling this, because if some one will read your blog post and then apply those tips in their blog, if those tips will not work for his or her blog then it is a negative sign for your blogging career, as a newbie blogger you need to create trust for providing great information for people through your blog, no matter on which niche you are blogging. Now, come the next point, why I am saying you to write more lengthy blog post instead of short one, actually this is one of the fact of SEO, more lengthy and informational article you will write, you will get more visitors from search engines, even it will improve day by day, it's not over yet even your returning visitor even will increase, which is the best ever sign for becoming a professional blogger, for seeing your blog returning visitor, I will suggest you to use Google Analytic Tool, don't worry it's free and trusted too. Title matter, if your blog post title is not up to the mark then probably your whole work is going to be dump, so the question is that, how would you write an effective title which drive traffic, I have a simple way to write an effective title of a blog post, simply think yourself as a reader not as a writer, if you would be hunting the topic to read, what would you search on search engines? Just give that title name other wise use Google Adwards Keywords Tool. The concept is simple give title name, what people are searching on the web for finding the article you are writing. And see the flood of traffic coming to your blog. One more method I usually use to find out a perfect title name of my blog post, I just search on Google about the topic, I am going to write, then I have seen suggest terms from Google at the bottom of the page, then I just noted down those keywords to give an effective title name of the blog post, see don't be lazy while selecting a title name of a blog post, because almost title name of a blog post play important to drive organic traffic to blog. URL stands for Universal Resource Locator, but there is nothing you need to with this full name, you need to optimize your blog post URL for search engine crawlers, that's why your blog post will be top of the search engine results, at least on the first page of the search engine results. Now the question is that, how would you optimize your blog URL, here is the answer for you, if you are using blogger.com as a blogging platform then change permalink, to change permalink for a blog post you need to click on permalink(you can see this option on the right side of the blogger blog post table) then click on custom permalink and just copy paste the Title name of your blog post, remember one more thing you need to optimize your blog post URL structure for every time you create a new blog post, because URL structure of every blog post is different, although blogger optimize blog post URL automatically but I will suggest you to do it manually, because you are creating a blog post after this much effort then why not to optimize it properly. One more concept about optimizing blog post URL, this is one of the most conceptual, even many professional bloggers to this mistake, i.e. what to use in between the blog post title keywords, so we have three most popular options out there- Dashes or Hyphens>Underscores>nothing. But this is not going to help you to drive traffic from search engines, even it will decrease reputation of my blog, if we will see search engine optimization point of view. So optimize your blog post URL as I have given above link! I think you have read properly about title selections, now I am going to tell you one advanced SEO tips, which will increase visitors from search engine by 100%, because it will increase visibility of your blog post on search engine result pages. So, here is the tips for you, use keywords in your title according to importance, like for an example, I am writing this blog post, I have selected title then I have arranged keywords for the title according to importance means what people will first type word on search engine then second word then third, respectively for finding this article. That's why, when people will search on search engines then search engine crawlers will show my blog post on the top of the search engine results, because what people will search in the search engine the sentence exactly match with my blog post. Hopefully you got the point what I am talking about! Actually I have written a blog post on this topic, you may also read the blog post- Importance of keywords in title of a blog post. I have learnt this blog tips from my first PPT(Power Point Presentation), when I have given presentations on blogging in my college, then my guide said to me, to add conclusion about blogging at the end of the slide. When I asked him, Why? It's a long answer, he said to me, but I would like to share with you one good line, i.e. people will come to know about your topic of presentations from only last slide of your presentations that is conclusion, because, I think, you know! Even then let me tell you, because people will come to know, the main benefits and loss of your topic from the conclusion part, so I was thinking, why not to use this technique in blogging, then after few days, when I was browsing a blog, I found that blogger also using the same technique, because this is really effective in blogging. I don't know about you, what you know about blogging, may be you know you know commenting on other blogs can drive traffic to your blog even your blog reputation will increase. But let me tell you one more thing, in this sections I will tell you one unique way to drive traffic to your desire blog post through commenting from other blogs. See we know commenting will drive traffic to your blog, right, but let me tell you how you can drive traffic to your desire blog post through commenting, no it's not Commentluv, it's a new tips for you, just use blog post URL instead your blog URL while commenting and see traffic coming to your blog post, get that! Again this is a awesome way to make people read your blog, specially I promote my blog post on few directories, as I am from India but I like to promote my blog on Indian blog directories Indiblogger.in, even I got very good response from this, actually there are many blog directories to submit your blog. But I would like to recommend you one most useful blog directory which will increase your blog page views as well as provide a back link for each blog post and the most unique about this blog directory, you don't need submit your blog post, it will happen automatically. Probably you are looking for that blog directory right here is the name of that blog directory- bloggers.com, but it's down now. Forums and questions, answers websites are great place to find out problems of other people then solve their problems in your blog, then just do one thing answer there, but don't forget to leave your blog link, which will ultimately drive you traffic to your blog. Once, you will do it you will drive traffic more than even thousand visitors but that is depend on which topic you are answering there and also your way of answering. Because every niche having different different audience that' why. Let me tell you one more information about blogging. There are about 100 million live blogs but only 3% of them are making money online from blogging, simply I have to say those 3% blogger are really solving problems that's why they are making money online. You can do the same but for this you need to solve people problems then you need to monetize your blog to make money blogging, in short to come it those 3% category. Now it's amazing to tell your contacts about your newly launch blog, I know those contacts may be from family members or may be friends or may be colleagues. But this is effective way to tell your known people about your blog, but don't send them emails about your blog, when your blog is not having even a single blog post, because this is useless, send them emails about your blog when you have written your first ever blog post. Then even it would be okay. Because it will help your blog to get few readers for forever, I know every one is not going to read your blog, but at least few will read your blog those you will send emails. I remember that day, when I have first created my blog, I have send emails to my friend and then I told them to send emails their friends too, tell their friends of friends to send emails their contacts, in this way I got about 500 visitors to my blog from very first day. How amazing that moment for a new launch blog! Again this is a perfect method to get traffic as well as reputations of yourself in the near by colleges, you can also go outside but first of all go to near by colleges for presentations, it will help you to improve your presentations skills and then go outside. Personally I got around 500 subscribers from only presentations on colleges, when I have started blogging in 2010. Facebook is the word largest social networking website, that means maximum number of active users are there, so why you are not using Facebook to drive traffic to your blog. Hey, there are three ways to drive traffic to your blog, but one way is not that much effective for forever, but one time is effective that is share the blog URL on your wall. But other two ways are really effective, one of them is create a page on Facebook and another one is create a group on Facebook. Then don't forget to share your blog post there, because only creating a page is almost nothing, you have to make a relationship with them, there is one effective way to make a relationship them that is each time you will create a new blog post, share on your Facebook Pages as well as on Facebook Group but I think Facebook page is better. Twitter is a micro-blogging social networking website, beside this, this is a great platform to drive traffic to your blog as well as maintain a great relationship with your readers. Even you can make money from your twitter profile by using sponsored tweets, now the question is that how would you increase followers on twitter, dear use a gadget on the sidebar of your blog like mine one. Google Plus is a gift for bloggers to get good traffic as well as good rank on Google, see Google has given full credit to Google Plus, more people will follow you on Google Plus more authority you will get, which means probability of getting your blog post on the top of the search results is more. Even you can drive lot of traffic to your blog from Google Plus, don't forget to use Google Plus for your blog as well as get Google authorship, which will show your photo on each blog post. One of the most popular reading website for best articles, actually when you will submit your blog post on StumbleUpon, even you can get thousand of visitors to your blog for free, but it is depend on quality of your article. Personally I got many times unbelievable visitors to my blog from StumbleUpon only. Telling friends that may be online or offline about your blog, is a great way to promote your blog as well as you will get feedback from your friends about your blog. See, don't take feedback negatively, because feedback are always feedback, if it is negative then improve that area of your blog to take your blog to the next level. Do hard work, make it useful for readers! Become successful blogger! I know every one want to become a successful blogger, but I know even every one will not become a successful blogger, because every one will unable to drive good traffic to blog. Because it need hard work. See, blogging is good way to make money online but it takes time as well as need hard work(I know I am saying this second times) to make it happen for you, if you are ready to do it, then don't worry keep working one day will be yours. Actually this blog always helps me to carry on my blog site. This article also helps me. I think now i can get more visitors to my blog sites. Great, Let me know results after implementing these tips. 8th one is most helpful me. I also have a blog site. But I didn’t used forum answering to get traffic for my blog. Glad you find 8th one most helpful to drive traffic. Updating blog with fresh and unique content will help to drive more traffic.